This text summarizes the OFCE’s 2013-2014 forecast for the world economy. Six years after the onset of the financial and economic crisis, the acceleration in global growth expected in 2014 (Table 1) could have given hope for an end to the slump. While the sovereign debt crisis in the euro zone is of course over, and represents an important step, nevertheless aside from a few positive figures there is no indication that the crisis is at an end. Economic activity in the euro zone has reached a plateau, and the mechanisms underlying the sovereign debt crisis in the zone –in particular fear of default on public and private debt – could see the economies of the United States, Europe, the United Kingdom, and Japan plunge again at any time. The crisis is global and has features that have been rarely if ever seen in the past. Sovereign interest rates are, for instance, exceptionally low, except in countries where the financial markets are skeptical, but which account for little in the overall mass of public debt. This indicates a situation of a liquidity trap in which conventional monetary policy has reached its limits and where the ability of the monetary institutions to articulate a self-fulfilling future is crucial. However, as in the 1929 crisis, debate is raging about this capacity, raising numerous questions about an exit to the crisis. Monetary policy is at the heart of this uncertainty: are the extraordinary measures being taken stopping the economies from going over the brink? Would it be a good idea to lift these measures? Or is this really just an improvised makeshift with inflationary consequences that will be the source of the next crisis? Economic activity, as measured by the GDP of the euro zone as a whole, is no longer contracting. Despite this, existing idle capacity is not being re-mobilized. Yet as long as the economies continue to be marked by idle capacity, the impact of the crisis will continue to be felt throughout the society. Wherever you look – GDP per capita, output gaps or unemployment – the indicators describe a plateau that is well below the level of 2007. The persistence of unemployment that is markedly above its equilibrium level is, for instance, swelling the ranks of the long-term unemployed, many without benefits. The high level of unemployment is undermining social cohesion and threatening societies built on integration through work. The unemployed are thrown onto family or social security benefits, which are themselves subject to fiscal cutbacks. Young people entering the labor market are facing delays in gaining access to employment and will long bear the scars of that initial period of joblessness in their wages and their careers. But the impact of unemployment extends even further. The fear of losing one’s job or seeing one’s company close down or be relocated spreads to people with jobs whose salaries wind up being affected or who are forced to accept worse working conditions. Southern Europe for instance is engaged in wage deflation, and through the dynamics of competition, is drawing in its neighbors. The absence of a recovery is hardly surprising. A widespread massive programme of fiscal consolidation has been conducted in the developed countries. The total fiscal impulses from 2008 to 2013 can be used to make an assessment of the stimulation of the economies during the recession of 2008/09 and then of the fiscal consolidation that followed (Table 2). The debate on the fiscal multipliers, using empirical analysis based on structural modeling or the systematic review of historical events, validates the causality that runs from fiscal impulses to output gaps. 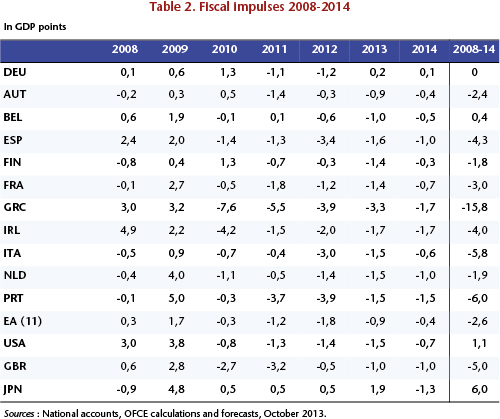 A large part of the output gap in 2013 is due to fiscal consolidation. There is no permanent impact of the crisis on activity, but there is the consequence of unprecedented fiscal austerity. The developed countries have undertaken this consolidation effort under pressure from the financial markets, backed by the European authorities. The fear of facing difficulty in financing the public debt (a significant proportion of which is renewed every year and which in the developed countries has a maturity of approximately 10 years) or of even losing access to finance altogether was reflected in higher sovereign yields and did not leave the States many alternatives. To regain credit, an ability to reduce the deficit had to be demonstrated, regardless of the price. The resulting consolidation was taken only as a preventive measure. The examples of Greece, but also Portugal, Spain and Italy, illustrate the risk of not having the public accounts in order. For some, including the economists of the European Commission, it was the massive consolidation undertaken by the Member States that made it possible to end the euro zone crisis. But there is an alternative explanation, one with heavy implications for the desirability of fiscal consolidation: the role played by the European Central Bank and the implicit commitments to solidarity on the part of the euro zone countries were more compelling than economic policies that prolonged and deepened the recession. The reduction of public and private debt in the economies is the key to exiting the crisis. This demands a clear and reasonable strategy that combines restoring economic activity and cutting unemployment, while maintaining low sovereign interest rates and conducting fiscal consolidation at a moderate pace. This strategy requires mastery of timing, consistency in the policy adopted, and coordination between the States and between economic agents within the States. In the euro zone, this relies on a credible commitment by the Member states to fiscal consolidation in the medium term and a commitment by the European Central Bank to keep spreads at a minimum. Fiscal discipline by the markets does not work – it has to be opposed by a political commitment to economic stability.